Do you know how to lose weight? Do you know how to create proper brain functioning? 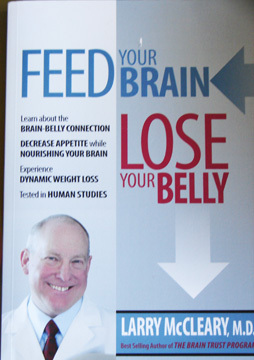 According to Feed Your Brain Lose Your Belly the answer is the same diet. This book promotes a diet that pulls a 180-degree u-turn away from the high-carbohydrate low-protein and fat that we had been taught starting the in the 1960s. We were told that fat was bad for you, so we cut the fat only to find that people are fatter, more diabetic and unhealthier than ever. Doctor McCleary approaches the question of proper diet from the point of view of a neurologist concerned about Alzheimer’s disease and mental function. At the same time that diabetes and other aspects of the Metabolic Syndrome (diabetes, heart disease, high blood pressure and weigh gain among others) increase with our sugary diet, so to do diseases that affect the mind like Alzheimer’s. He decided to research whether dietary changes would help the mind and then to see if these same changes would also help the waistline. The diet that results from the research is very similar to the food plans promoted by Doctor Appleton in all of her works. We both like diets with vegetables, protein, gently cooked lipids (fats and oils) and whole fruit that limits sugar, excessive carbohydrates and many other features of our modern diet. Except for the fact that Doctor Appleton is out of her depth dealing with neurology, she could have written this book. It appears that everyone with a responsible health oriented food plan comes to the same general realization that – eat more vegetables and cook at home – is the path to health. Dr. McClearly makes an important observation that being fat and diabetic and having cognitive problems are part of the same problem. We get fat because sugar and excessive carbohydrates are foods that induce the mind to rely on external energy sources, which are then stored as fat when there is too much in the system. We go nuts or get Alzheimer’s because the brain constantly wants glucose to function and in the high-carb diet sends out hungry signals that create more eating and diminish mental capacity. The trick according to Dr. McCleary’s research is to eat the better diet that includes fat, protein and vegetables and fruit with lots of dietary fiber so that the body realigns itself so that more fat is burned than stored while avoiding the confusing signals that may cause us to eat too much. He uses insulin to explain the cycle of fat storage and blood sugar levels. More sugar means more insulin to deal with the sugar, which also tells the body to store fat because high blood sugar means an external energy source is being used. Less sugar means that the body now can burn fat from internal sources to tide the person over between meals. This cycle is supposed to be balanced but stopped being so when our diet became more about carbohydrates separated from dietary fiber than protein and vegetables. Once the explanation how the brain is affected by the foods we eat set in, Dr. McCleary provides fairly standard advice about how to lose weight that the reader may also glean from the saner programs developed for The Biggest Loser or any responsible food health book (take healthy snacks along, start small, plan for falling off the wagon, be positive and so on). And there are recipes, which seem to be a staple of food health books designed to give a few ideas how to actually go about changing the diet. Doctor Appleton may have wished for a little more attention to allergies playing a part in health, but other than that she wholeheartedly recommends this book to anyone wanting more information about how the brain and body work together for health.